“The neighborhood was a maze. And now it had its minotaur…” This line, from relatively early in the book, had me hooked to this story, and the artwork by Jean-Charles Poupard is beautiful. The title says it all. This is a Jack the Ripper story, but the twist to it is the connection author François Debois makes with murders in France about the same time. In fact, other than the obligatory naming of some of the Ripper’s victims, and a description of what he did to the bodies, very little takes place with the Ripper. Well…maybe I should put it that very little takes place with the regularly attributed Ripper killings. The story interested me very early on, but the middle third of the book really seemed to drag and I caught myself simply looking at the pictures and only half-heartedly reading the book. The last third of the book did pick up, but there was a great deal of information about some characters that I didn’t understand. But what does keep us reading this is the art by Jean-Charles Poupard. Poupard manages to capture the seedy underbelly of London (and Paris) just prior to the turn of the century, with all its darkness, and yet keep the art bright and lively enough that we aren’t struggling to make out what’s happening. It has been awhile since I have seen graphic novel art that is so slick. I would have been very happy to have kept turning these pages to keep looking at this art. I really liked this book, but I do think the story could have been a bit stronger (or more consistent) all the way through. Looking for a good book? 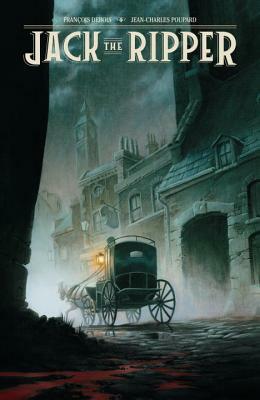 The French graphic novel, Jack the Ripper, by François Debois and Jean-Charles Poupard adds a new element to the Ripper legend by tying in some murders in Paris, but the story struggles mid-way through and picks up again to finish off the book. Reading old science fiction, which was set in the future at the time the book was written, but which is now in our past, can be a real hoot! Parts of this story are frighteningly real today, but some of it just makes me shake my head. Set in the future of 1996, the men and women aboard the Boreas, an enormous meteorological satellite are the first (and last?) line of defense for all humankind as a mega-storm threatens the planet. As with most good science fiction, the science is a backdrop to the story and the story is about people. But people are dangerous and it’s possible that the devastation of Nature is tame compared to the wars, and politics, and corruption of humans. This book, first published in 1974 has some surprisingly correct predictions. The volatile fury of nature, for one. In the last few years from when this blog is being written, we hear reports of un-natural weather patterns and super-storms which are reaching a fierceness that has never been witnessed before (due to our destruction of the ozone – which is NOT mentioned in the book). The other eerie prediction is the space station Boreas. 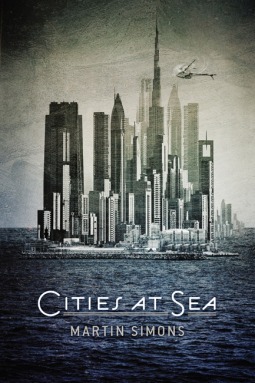 While the International Space Station is nowhere near as luxurious as the station in this book, the idea that there are men and women living on a station that orbits the earth, monitoring weather (and other things), really was just the idea of a a science fiction writer in ’74. But while these were nicely thought out, there were times I raised an eyebrow: a man arrives on the space station and lights up his pipe. Smoking?! In an enclosed pumped-oxygen environment? Really? That made me shake my head, but I actually chuckled when people started to use a manual typewriter on the station. Despite science that doesn’t hold the test of time, this book was an enjoyable read. A battle, of sorts, for power, on the station is interesting, and the backdrop of a super-storm threatening Earth adds an extra element of danger. If you should see this book available in a used book store somewhere, it’s worth reading. Which shouldn’t be a surprise — this is the first book in The Harlan Ellison Discovery Series. Harlan Ellison has some pretty high standards. Looking for a good book? 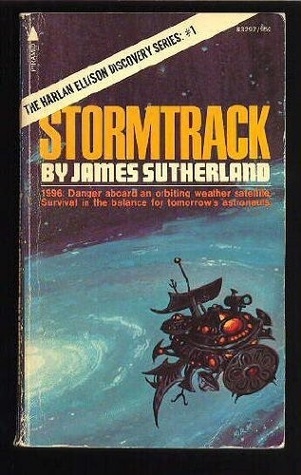 Stormtrack, by James Sutherland, is sci-fi from the mid-1970’s that is worth reading if you should run across a copy. I should start by stating that I am often very wary of books that have won awards that I have never heard of. No, I am not the world’s authority on literary awards, and no, I don’t mean to imply that the award was created specifically for that book (though I have run across that). What makes me wary is that too often I have found that these sorts of awards tend to go toward ‘form’ rather than ‘content.’ I feel that this holds true here. Ms. Freedman is a high school English teacher in a class full of misfits. In an interesting and creative move, she asks her students to write essays where mythical creatures solve the worlds social and political problems. But Ms. Freedman suffers a mental breakdown and is sent to an insane asylum. There, she corresponds with two of her students, Cody and Janice. The book is told through narrative, letters, and the class’s essays. I liked the foundation of this book, and what it sets out to do, but it feels … messy. Incoherent. It doesn’t follow one person, and it doesn’t stick with one narrative format. It’s essentially a whole lot of short pieces that sort of tie together, but as short pieces, they don’t really stand alone and as a whole, they don’t form one very cohesive story. Even though I could see the unique and interesting aspects here, and I often enjoy off-beat fiction, I struggled to get through this book. The classroom, as run by Ms. Freedman, was totally out of control. Early on, I had such little respect for this ‘teacher.’ Her class seemed to run over her, but she seemed to allow it. Instead of feeling sorry for a teacher with an unruly class, I felt sorry for a class with a teacher who didn’t know how to handle her work. But then she’d do something interesting, like assign a clever essay. Mostly I felt that this book was as much as mess as was the classroom. I don’t think that’s the sort of metaphor the author was trying to get at. Looking for a good book? When Mystical Creatures Attack! 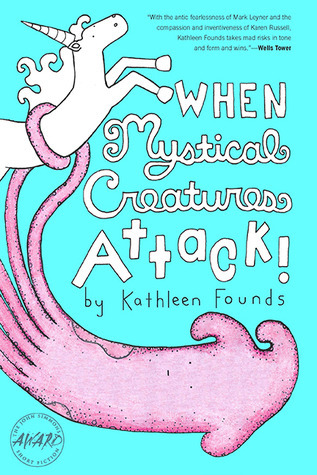 by Kathleen Founds struggles to tell a story and rambles with a whole lot of short pieces. Alright… so ‘bizarro’ fiction has become a “thing.” I mean … I know that there’s been bizarro fiction for a long time (I think I was writing it back in the 80’s), but it hasn’t always had its current classification (it was speculative fiction, with a twist back then). Now it’s its own genre. And I love bizarro fiction. One of the earliest reviews on this site was for Blope, an excellent bizarro story, so I was pretty interested in this. 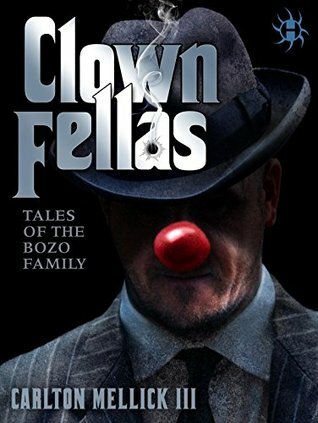 ClownFellas is a short story collection in which the stories loosely fit together to tell a novel-length story. Is this bizarro world, mob-like families are circus clowns, with the leading family being the Bozos, and telling jokes is against the law. In addition of fending off the police, they have a rival circus of clown from France (La Mystere) trying to hone in on their territory. The clowns will probably kill you, but they’ll likely throw a pie in your face first, or squirt seltzer down your pants before cutting your neck because, well, they’re clowns! In the first ten pages or so, I laughed and nodded approval at some of the gags, and I rolled my eyes at a few that were too obvious, and I was maddeningly frustrated at being told, SO many times, what the term for a fear of clowns is (it’s coulrophobic). And then I had 400+ more pages to read. Essentially, this is one giant joke. Substitute clowns for mobsters and see what funny things we can make of it. The answer is: not a lot. Once the novelty of this idea wears off (about ten pages for me) there’s not much else here to hold the interest. As mobsters, I really don’t care about these people. As clowns they are slightly more interesting, because they shouldn’t act like mobsters. But they do. I think that’s the basic problem here…it doesn’t go far enough into the bizarre. It’s as if Mellick took the Godfather and made everyone a circus performer. That’s really only changing the surface of the characters … their appearance and the kinds of slapstick they might do in public. But Mellick doesn’t change the way they think, or what motivates them. Not really. And so we’re left with a mob book that relies on one joke – substitute everything with clowns, jokes, and pie throwing. Ha ha, isn’t that funny! This looked really interesting (I don’t request a book to review unless it looks interesting), but it really didn’t follow through on what it set out to do, at least not for this reader. Looking for a good book? The joke is on the reader because ClownFellas by Carlton Mellick III, relies on one basic gag all the way through 450 pages. Warren, the 13th, is a twelve-year-old bellhop in a strange hotel that rarely sees any guests. Warren will inherit the hotel, which was started by the first Warren in a successive line of Warrens. Also in the hotel is Warren’s Aunt Anaconda who has taken over the management of the hotel, but Warren knows that the real reason she is there is because of the legend that a treasure, known as The All-Seeing Eye, is hidden on the grounds somewhere. Warren knows that the only hope of preserving the family hotel is for him to find the treasure first. This is a middle-grade reader book, filled with luscious illustrations. On the one hand, the story is quite simple. It’s young boy vs evil adults with boy’s history and future at stake. This is just the right kind of story for this target audience. On the other hand, the books is overly long and drags on. I was bored through most of the story. What is there here to hold the reader’s attention? Oh yeah … there’s art. I received an ARC of this book, delivered directly to my Kindle, and only about half of the artwork showed up, but even with that, I could see that the appeal of this book is in the fantastically odd art by Will Staehle. The art is a cross between Charles Addams and the Muppets. It’s slightly creepy, slightly off-kilter with a slight bit of whimsy. It is what holds the reader’s interest, but it also confuses me some. Nothing that I recall reading lead me to believe that Warren was a little monster, in a long line of monsters. But look at that book cover at the top of this review… that is not the drawing of a little boy, or human child. So is this a world of little monsters, some friendly, some otherwise? That changes the perceptions of the story (otherwise why make them monsters?) and yet … and yet the story doesn’t seem to need them to be monsters, so … I don’t know. It just confused me. Overall, I liked the basic concepts of the book, though it didn’t hold my interest all the way through, and I like the art (that I was able to see), but I’m not clear on why the art is featuring characters the way that it is. This book is middle of the road, for me. Looking for a good book? 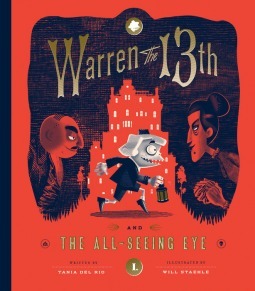 Warren the 13th and The All-Seeing Eye by Tania del Rio, with art by Will Staehle, is a middle-grade book with quirky characters and an off-beat look that will appeal to the imaginative middle-graders, but it may not see a lot of repeat reading. Not too long ago I reviewed a book about Winsor McCay, titled Wide Awake in Slumberland (you can see that review here). Fortuitous timing as I would otherwise not understand the background for this beautiful graphic novel, Little Nemo: Return to Slumberland. King Morpheus’ daughter, the Princess of Slumberland, is looking for a new playmate. The person chosen is one James Nemo Summerton. He is chosen because his middle name is the same as the young lad who visited Slumberland and the princess many years before. This Nemo is hesitant to leave the safety of his bed, and is definitely not interested in playing with a girl, even if she is a princess, but does reluctantly agree to leave. There are a number of false starts as Nemo wakes up on his journey to Slumberland, sending back home to his room. And once, when he doesn’t wake, he winds up sidetracked by Flip Flap. But as Nemo learns to have fun in Slumberland he can hardly wait to go back to sleep to have more fun. Let me say that the artwork here, by Gabriel Rodriguez, is stunning. It perfectly captures the beauty and the whimsy of McCay’s original works but adds a modern eloquence. The detailed pictures, with thick, bold lines, and bright colors is wonderful, but it’s the playfulness and use of panel-flowing-into panel that reminds me of McCay. The story is generally simple (again, evocative of Winsor McCay) but allows for the simple fun to move forward. I really enjoyed how James Nemo Summerton has no idea what or where Slumberland is — that he is not the same Nemo from the earlier books, whereas those in Slumberland may be the same. This is a book that I want to run out and buy and put in the hands of young readers. The story should grab them and the art will captivate. It’s the sort of book that could easily get non-readers interested in books while those of us who already love books, will want to have this on the shelf. Looking for a good book? 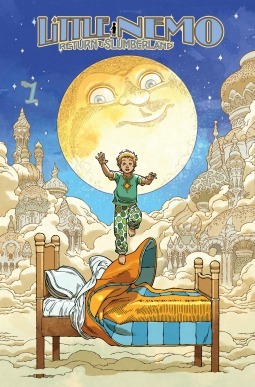 Return to Slumberland is a return to a time when comics were fun. Simple but beautiful, this is a graphic novel that will appeal to readers of all ages.